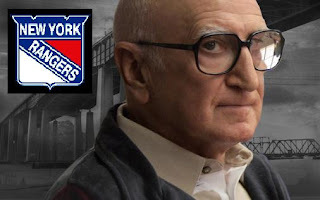 The opening of tonight's Original Six matchup against The New York Rangers and Toronto Leafs began with Dominic Chianese, the actor who played Junior Soprano, singing both the Canadian and American anthems. "O'Canada" was sung with gusto, strength and determination. "The Star Spangled Banner" felt scrappy & forgetful, more like his character on The Sopranos, and as the crescendo "...and the land of the free...." was approaching, he went for the high note. Like Peter Brady's puberty changing voice, Junior's tone flipped back and forth and he lost it. A shameful rendition. No recovery. And thus the story of the Rangers tonight losing 6-2 to the Leafs, except they never even attempted the high note. Recap here. A bad game indeed - the second of the week, tonight being the worst of them. For the first time this season, I can safely say that Henrik Lundqvist was awful. A terrible week for our starless goalkeeper. Tonight he let through four goals of ten Leaf shots and was replaced by Stephen Valiquette to open the third period. Stephen's performance was stellar at first, but our broken defense and non-existent lines were no match for a Toronto onslaught. Two more goals later -- the Garden Numb exited feeling deflated and questioning our supposed rebound from Monday's Carolina hangover. I know, I know - it's just another game and they'll come out of the slump. The difference between this season versus the previous two seasons is there are no middle ground wins or losses. We only get one of two teams showing up: 1. the really good team or 2. The really bad one. Good hockey brings a satisfaction, a crave to watch more and be present when you have the opportunity to throw your hat on the ice, cheer in a good body check and honor those you choose to follow. I am satisfied with a great game of hockey, win or loss, and an extraordinary fan of my Blueshirts, but come to think of it - I cannot remember experiencing this type of game this season yet. I don't like it one bit, and I will admit I cannot put my finger on it. Bad coaching? Bad leadership? Bad management? Marek Malik? Marcel Hossa? Strudwick? Free agents? A little of all the above? My fellow Ranger loyalist - Captain Martin - joined me for the game tonight and we both agreed this is a season of unknown. That 'shoe-in' slot for the playoffs is a long way off - and every team in the Atlantic Division is improving steadily, each getting their game together. The Rangers are the equivalent of today's S&P500, no consistency with scary dips and rebounds every week. The competitive truth is the "best to the worst" in the Atlantic Division is only a two-win difference. The Rangers are in Atlanta Thrasher Land tomorrow night, so hold your breath, pull a tooth out and place it under your pillow - and make a wish. "Dear Lord (Stanley), please make sure Gomez skates the same speed as his fellow players and that Coach Tom Renney has read The Art of War at least once." Which team do you think will show up in Atlanta tomorrow night? Horrible rendition of the anthems, horrible rendition of a hockey game. Its times like these that I finally have an explanation for my hair loss. 2) Henrik was ordinary. They can't win if he plays average goal. Perhaps he's a bit tired? Big valley can't be faulted for letting in 2 when the team had already all but quit and coming in the 3rd sitting for 2 hours is tough duty. 3) This game will only be recalled if tonight they play the same. Sean where are you!?! faux...he must be sitting on the sidelines, grinning with delight...he watched the game from the 400's last night again -- making him the blue-collar audience Ranger favorite. Haven't had "one of our people" in a long time...the Europeans have invaded. This is a blip for Henrik -- I like Vally -- and this will give him more ice time. Avery deserves the 3.5 mill he wanted -- trade in Patrick Carcillo from the Coyotes and we'll become The Chiefs!!! !